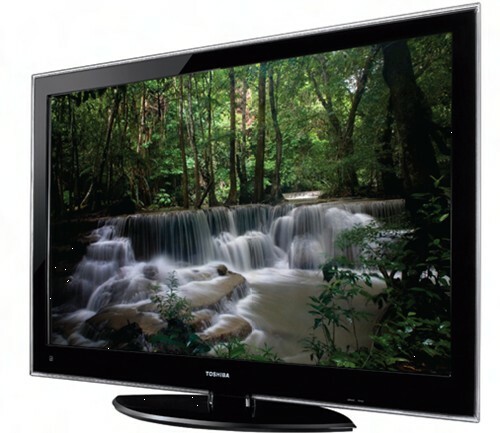 Toshiba is positioning its Regza UX600U LCD HDTV series as the ultimate in home networking. 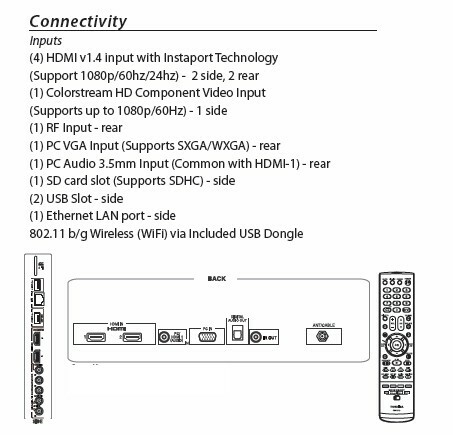 “When combined with a Toshiba notebook featuring the new Toshiba Media Controller application … the UX600 series allows users to easily stream videos, music and pictures from other DLNA (Digital Living Network Alliance) devices without the usual headaches and hassles,” says a Toshiba promotional pamphlet. At a products showcase organized by Toshiba Canada Ltd. in Toronto last month, the UX600, along with the company’s much-publicized 3D Blu-Ray laptop (Satellite A660-3D) was demoed by Graham Anderson, a product trainer with the firm. A highlight was the use of the Toshiba Media Controller application, (that was loaded on the 3D laptop) to stream multimedia to the UX600 LCD TV. I recently got to test out this functionality for myself. For my tests Toshiba sent me both its 46-inch REGZA UX600U TV (the display also comes in 40-inch and 55-inch flavours) and a laptop (not the A660-3D unfortunately) loaded with Toshiba Media Controller. In Canada, the UX600 is available for sale at some national Big Box retailers, such as Leon’s and The Brick, as well as a number of Toshiba Canada’s regional dealers. The price ranges from around $1,600 (for a 40-inch model) all the way to $2,500 (for a 55-inch unit). How does the UX600 perform as a network TV? What are its strongest features? What are its drawbacks? How easy is it to stream rich media to this HD display, especially from a DLNA laptop loaded with Toshiba Media Controller? Does the UX600 include any other compelling multimedia features? These are questions we will seek to answer in this review. From the aesthetics standpoint, this is a TV you would certainly love to have in your living room. It’s just around an inch-and-a-half in width, and includes a slender black frame encased in a transparent bezel. You have the option of placing the unit on the included pedestal stand or wall mounting it. The former option requires you to attach the TV to the pedestal with screws (provided) and then use the “securement clips” at the rear of the TV for further stability. You can’t swivel the TV on the pedestal, though, a feature that would have been desireable. Like most high-end LCD TVs, the UX600U offers a wide range of connectivity options — something that users with multiple devices will appreciate. Some of the ports are on the side panel and some are on the rear of the TV. They are all listed below. For most TV viewers, picture quality is the sine qua non, and on this score the UX600U comes out in (excuse the pun) flying colours. 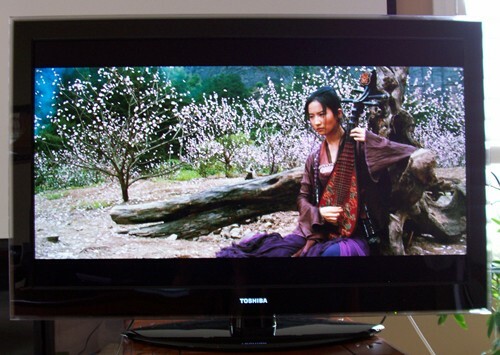 This feature is best experienced when you watch a Blu-Ray disc at 1080p resolution. In the pawn shop scene, despite the subdued lighting, every tiny fold and crease on the aged Lu Yan was clearly visible, as were the intricate designs on the burnished magic bow staff and other antiques in his shop. The audio on the UX600U, though, is nothing to write home about. It’s passable at best and had a tinny quality to it. I experimented with the Advanced Sound Settings on the menu changing the Bass, Voice Enhancement and Dynamic Bass Boost controls – and also used the Surround Sound function, but they didn’t make any significant difference to audio quality. Bottomline: if you’re watching HD video on this display hook it up to a really good audio system. (I connected it to Yamaha HTR 5620 home theatre system and was ready to rock and roll). This is the most publicized capability of this HDTV. You can either create a wireless connection to your home network — using the provided wireless dongle, or wired one. In my tests I used both options. For the wired connection, as my router was in a different room, I connected the TV’s LAN port to a SlingLink Turbo. This product from SlingMedia uses your home’s electrical outlets to provide a hardwired connection to your router. Use Media Player to play music, photo or video files from other DLNA-certified devices on your home network – such as laptops or PCs – using the TV’s Media Player feature. (DLNA technology enables consumers to move multimedia files — such as videos, photos, music — between compliant devices over a home network). In my tests, while the YouTube and Media Controller functions worked, Widgets and VUDU didn’t. Each time I tried to access the Widgets, a “Loading” message appeared on the screen and just remained there. During the Toronto product showcase, the Toshiba rep told me that Canadian consumers would be able to access VUDU on the UX600U. However, the FAQ on the VUDU Web site states that “the VUDU service is only available in the United States.” As the FAQ was last updated more than two years ago — on April 25, 2008 — I checked with VUDU if the situation had changed since then. In his e-mail response, company spokesperson Bruce Lidl said, “…VUDU itself is not limited geographically, but the content is limited to U.S. distribution.” (italics mine). Anderson said he has home Internet service from Rogers and is able to access all the widgets and watch movies off Vudu on the UX600. Accessing and playing YouTube videos on the TV, though, is a breeze. The UX600’s user-friendly on-screen keyboard allows you to search for your favourite videos quickly. Videos I viewed were sharp and vivid, at least by YouTube standards. Even in full-screen mode picture clarity was remarkable. I watched a clip from an old Agatha Christie classic, Death on the Nile (1978) starring Peter Ustinov and the video quality was almost as good as the DVD of the same film I had happened to see just a few days earlier. 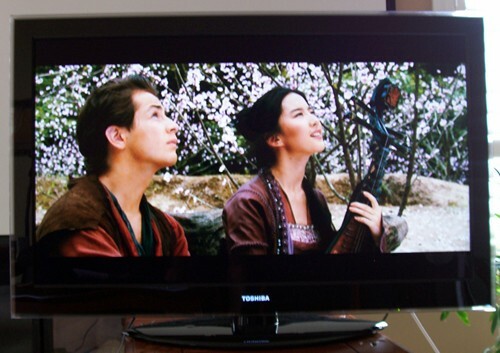 Using the TV’s Media Player function, I could easily access Photos and Music from other DLNA compliant PCs in my home. However with videos it was a different story. I either got a ‘Media playback error’ (though most of my videos are in .avi format that’s supposed to be playable on the UX600) or else there were huge lag issues. You use either a “pull” or a “push” approach to access media files from another DLNA compliant device and play them on the UX600. We’ve described our experience with the “pull” function – where you use the Media Player feature on the UX600 to access multimedia files from a DLNA laptop located in another room. However, you can do also do the reverse viz. “push” media files from a DLNA laptop to the TV. To enable this, Toshiba provides a proprietary application called Toshiba Media Controller. Toshiba sent me a laptop pre-loaded with Toshiba Media Controller, so I had an opportunity to test out the application. My experience was mixed. The user interface is simple enough. The opening screen is divided into two vertical halves. The left side displays multimedia files (photos, videos, music) resident on the Toshiba laptop, and the right side, other DLNA compliant “media renderers” on your home network — in my case it was the UX600. You can select a photo, music or video file from the left side and drag-and-drop it on to the UX600 or any other media renderer shown on the right side of the application and the file starts playing on that device. You can also create a Playlist comprising different types of media – images, songs, video. The right side also has player control buttons – so you can pause, stop, forward or go back. In my tests, I didn’t have any difficult pushing Photos and Music from the Toshiba laptop to the UX600. However with videos my experience was disappointing. Playback was so replete with pauses and lags that viewing was virtually impossible. This was also the case when I used a hard wired connection to my router, so it had nothing to do with my home network speed. This glitch needs to be fixed before Toshiba Media Controller works fully as it’s intended to. All in all, though, this is the UX600 is a decent TV for home networking and if you can fork out between $1,600 and $2,500 it may just be the answer to you entertainment needs.